The highlight of the thirteenth and final book of Euclid’s Elements was the proof that there are just five “Platonic solids”. Recall that a regular polygon is a plane figure with all sides and angles equal, for example a square. By joining identical polygons together, we can form solid bodies called regular polyhedra. Thus, with six squares we can make a cube like a dice. Four equilateral triangles make a tetrahedron, eight make an octahedron and twenty make an icosahedron. The fifth and final regular polyhedron is the dodecahedron, with twelve pentagonal faces. Plato used the regular polyhedra in an early atomic model and we still speak of the Platonic solids. The great genius of antiquity, Archimedes, discovered that by using more than one type of polygon he could form thirteen new “semi-regular” solids. Much later, Kepler constructed a magnificent but incorrect model of the solar system using the Platonic solids. This relationship was found by the Swiss mathematician Leonhard Euler in 1750, and is now called Euler’s polyhedron formula or, more colloquially, Euler’s Gem (see the beautiful book of David Richeson referenced below). And a gem it is: although simple enough to explain to a young child, the formula has sweeping implications throughout mathematics, with repercussions in topology, network analysis and dynamical systems theory. 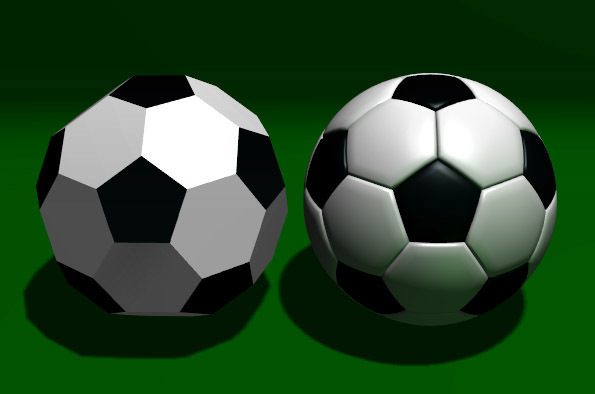 Football based on the truncated icosahedron [image from Wikimedia Commons]. It is easy to check that a cube has eight vertices, twelve edges and six faces, so the formula holds. But it applies much more generally. Any surface can be divided up into a mesh of interlocking triangular pieces; cartographers construct maps using this process of triangulation. Thus, a curved surface like the globe is approximated by a polyhedron with flat faces. No matter how the globe is triangulated, Euler’s formula holds. A Bridge between Geometry and Topology. In geometry, lengths and angles are fixed. We can move shapes around but no distortion is permitted. Topology is geometry with rigidity relaxed. Shrinking and stretching are allowed, though no tearing or gluing. So, a sphere and cube are topologically equivalent: a round ball of Plasticine can be squashed into cubic shape. But a sphere and torus are distinct: we cannot change one into the other without making or filling a hole. A torus can be triangulated just like a sphere, but now Euler’s number X = V – E + F becomes 0 instead of 2. More generally, if we triangulate a surface and find Euler’s number X, we can be sure that there are N = ( 1 – X / 2 ) holes in it. A much broader result, the Gauss-Bonnet Theorem, relates the total curvature of a surface (which is hard to compute) to its Euler number (easy to get). And an even more profound consequence is the Atiyah–Singer index theorem, proved by Michael Atiyah and Isadore Singer in 1963. Euler’s formula has some sporting implications. One brand of golf ball has 232 polygonal dimples, all hexagons but for twelve pentagons. And the football popularised in the 1970 World Cup in Mexico was based on a truncated icosahedron with 20 hexagons and 12 pentagons. Since then, chemists have synthesized a molecule with this shape comprising 60 carbon atoms, earning a Nobel Prize and starting a new field of chemistry. Hexagonal meshes on a sphere have other serious applications. Some computer models used to simulate the Earth’s future climate use them to achieve a uniform distribution throughout the globe, circumventing the problem of polar clustering with conventional latitude-longitude grids. But hexagons alone will not suffice. Euler’s formula constrains all these grids to have precisely twelve pentagons.